The importance of the above options becomes clear when we ask the question "What if energy availability declines?" 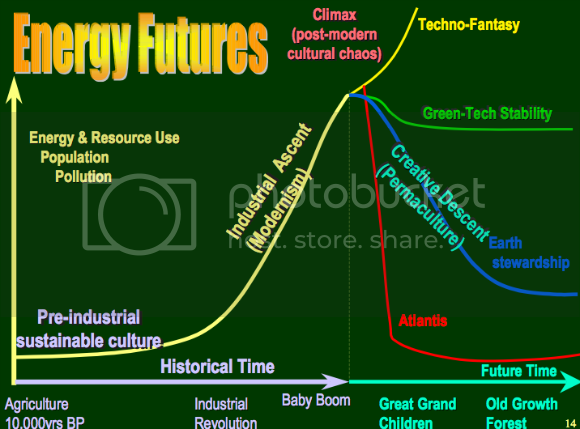 Beyond the abundant availability of fossil fuels is an uncertain energy future that has been pictured in various scenarios that range from "techno-fantasy" (e.g., unlimited nuclear cold fusion with no unforseen negative impacts) - an absurdly optimistic scenario but frightening in its implications for humanity and the planet - to an "Atlantis-like" fate in which our culture "goes under". Most of the sustainability debate is focused within the "green-tech stability" scenario in which we essentially maintain a steady (albeit somewhat reduced) level of energy usage by progressively moving to renewable sources such as wind, solar, tidal power, etc., as fossil fuel reserves are used up. Radical and Maoist ? Or realistic and forward thinking ?